It can be hard to meet new people, especially in the triathlon world, but triathletes aren't as intimidating as they seem. Whether you're new to triathlon, new to town or simply need a new crowd, here are six ways to find people just like you. Tri clubs can be found in most major cities—and a good number of small towns—across the country. They often serve as the center of the triathlon community. Most clubs have an array of activities to choose from including group workouts, training clinics and informational talks. Membership fees are reasonable, at around $45 to $60 per year. You've heard of Master's swimming; it's time to try it. Not only is it a great way to get a pool workout without having to plan it yourself, it's a great place to meet other triathletes, pick up swimming tips, and make new friends. Many Bike shops host weekly rides that leave from the shop and are open to anyone with two wheels. Call for departure times and be sure to ask about the average pace of the rides to find one that best suits you. Events hosted by the local tri club or shops draw a lot of new, eager triathletes looking to soak in as much information as they can. Stick around and introduce yourself. Engage in conversation, ask about group workouts, and let people know what you're looking for. It's certain that everyone has a weekend workout planned but they might not have a workout partner. With everything from euchre to underwater hockey, Meetup.com has something for everyone, especially runners, cyclists and swimmers. Even if you don't participate regularly, a few groups rides or runs can be all you need to meet a few fellow triathletes and plan your own—sometimes more convenient—workouts. Similar to bike shops, many running shops host regular runs. These attract people outside the triathlon crowd and can easily help expand your pool of training partners. Hash runs are always a fun alternative. 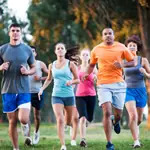 Although more social, Hash events are less intimidating than triathlon workouts and they draw a lot of serious runners that might be up for a non-Hash jog. Find a training partner at your next race. Michelle Valenti is the triathlon and swimming editor for Active.com. Her favorite part of training is getting active with family and friends. Follow her on Google+.